Ringling Brothers bills itself as “The Greatest Show on Earth,” but Salesforce.com’s Dreamforce 2011 could easily claim the title of “The Greatest Cloud Computing Show on Earth.” With over 40,000 attendees, dozens of exhibitors, great concerts and parties, and presentations galore, the event was an unqualified success for Salesforce.com, but it also heralded a real coming of age of enterprise Cloud computing. Why? 2. Salesforce.com knows how to throw a party, but they also know how to create a movement. The speakers across the board (from partners and customers) accurately and compellingly presented the Salesforce.com themes of the show – Cloud, mobile, and social. The Developer Zone was hopping with highly effective and productive sessions teaching developers how to become part of the Cloud, mobile, and social revolution – and what developer doesn’t want that? The vendors I spoke to said that they were very happy with their Salesforce.com relationship, that a very large fraction of their leads came from salespeople at Salesforce.com, and that the show was very much worth the money spent on the booth and related expenses. This is an ecosystem that has the Cloud, mobile, and social religion – because customers are leading the way. Oh, and Salesforce.com didn’t let this event go by without using it to maximize its impact on their top line. Deals were being struck, and you can expect to see the results in Salesforce.com’s next quarter numbers. 4. The Salesforce.com team did a great job on the logistics for the show, despite its monumental size and enormous growth over previous shows. Keynotes were delivered well, camera angles were picked intelligently and for maximum visibility, schedules and meals were arranged to maximize traffic in the Cloud Expo, and thousands (seemingly) of developers were given the requisite skills to build their first Cloud, mobile, and social apps. 5. Salesforce.com has so much momentum in Cloud, mobile, and social, that several partners and even competitors arranged events around this show. 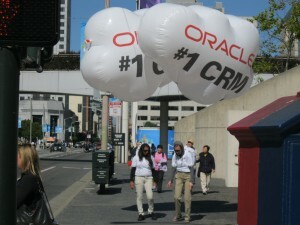 Of course, there was the predictable Oracle attempts to do some guerilla marketing around the event – not Oracle’s greatest and most successful marketing moments. One other competitor hosted an analyst gathering right after Dreamforce, and several partners had similar events before and after the conference. 6. Perhaps lost in all the hoopla were some impressive product announcements, demonstrating that Salesforce.com continues its ambition to lead by example, and to continue innovating to create customer value: Data.com, Chatter Connect, Chatter Approval, Database.com availability, social profiles, touch.salesforce.com, and much more. Once again, Salesforce.com has put on a great show, but Dreamforce 2011 was much more than that – it may have marked the beginning of an industry-wide movement to the Cloud.